Written by webb valarezo on Friday, March 28th, 2014 at 9:26am. Finding an inner strength that carries you past the heartache of a broken relationship is a sentiment that permeates the work of Sharon Jones and the Dap-Kings. And as beautifully as that sentiment is expressed throughout the band’s albums, it can be a little one-dimensional, as it usually involves some variation on a man who has done Jones wrong. But when you read about her struggles within the record industry and her recent battle with bile duct cancer, her songs about heartbreak and loss take on a whole new meaning. 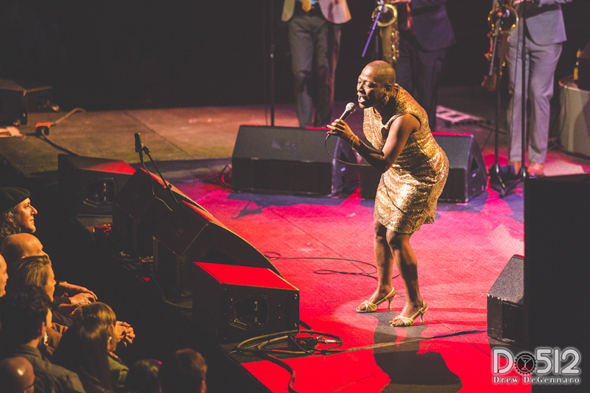 After a big buildup from her band the Dap-Kings and her backup singers the Dapettes, a jubilant and vivacious Sharon Jones strutted onto the House of Blues stage and started singing like a woman with a new lease on life. Actually, being cancer-free since the beginning of this year, she really is a woman with a new lease on life. It was inspiring to watch her lead the best R&B band in the world through such an energetic set knowing that, only a few short months ago, Sharon wasn’t sure if she’d ever be able to sing again. But there she was, carrying the torch for old-school soul music with such vigor and pride. And just in case anyone at the sold-out show wasn’t aware of how lucky we all were to hear her sing again, she triumphantly incorporated lyrics about her battle with cancer into songs like “Get Up and Get Out” from her fantastic new album Give the People What They Want. On the surface, it seemed like another song about overcoming a dysfunctional relationship with a partner, but she switched up the lyrics, adding “I told that cancer to get up and get out,” further emphasizing that her lyrics can mean more than they seem. The first half of Sharon Jones and the Dap-Kings’ set was made up of songs from their new album. Then about midway through, they deviated and started to play songs from their older releases. A highlight of the evening was an extended version of “Heard It Through the Grapevine,” which Jones sang just like Tina Turner would have. She also took a few minutes during the instrumental to teach us all how to do the twist. Beyond the emphasis of triumph and gratitude that permeated the night, it was an incredible joy to simply be there watching Sharon Jones and the Dap-Kings keep the spirit of this fantastic music alive.